Some time while you are testing you need to debug some things in your asp.net application. Suppose you have run the application with ctrl + f5 and now you want to debug some things, then there are two things either you close the browser and press f5 and start debuging but if your application is heavy that will waste lots of time for your application, second way is some thing tricky but you can debug things. We have aspnet_wp.exe(asp.net worker process) running on machine where iis and application is installed. Now suppose at present you are browsing default.aspx page and you want to debug it without pressing f5 . Then go to the your visual studio IDE -> Debug menu-> Attach Process. Select the aspnet_wp.exe process and click 'attach to process'. Now your application instance will bind with code. You can set the debug point as you do with normal debugging and it will work just as normal debugging. So you can start debugging without wasting so much time. Microsoft has just released the visual studio 2008 and .net framework 3.5. I have found a great link to discover what's new in visual studio 2008 and .net framework. The Link contains following things. Visual Studio 2008 and .NET framework released by the Microsoft recent days.It has lots of new features compare to it's prior version. With asp.net 3.5 you can now develop web application as you are developing desktop application. You can give functionality to asp.net web application just like desktop with lots of new technologies with .net framework 3.5. I have found a great link form where you can download asp.net 3.5 and visual studio 2008. String.Compare can be or not be case-sensitive, and can incorporate anynumber of comparison options, including culture-sensitivity and sortingrules. That is, it is not comparing the exact strings necessarily, but canbe configured to do various sorts of comparisons. String.CompareOrdinalcompares the numeric values of the individual Unicode characters of thestrings. In other words, it is always case-sensitive, and neverculture-sensitive. String.CompareOrdinal is faster (more efficient) when you don't need to do aculture-sensitive comparison, and you do want to do a case-sensitivecomparison.String.CompareTo is case-sensitive, using an Ordinal comparison, andculture-sensitive, but always uses the current culture. It is faster thanString.Compare, but less efficient than String.CompareOrdinal. Some time we need to summarize data very quickly without writing very complex query. CUBE And ROLL UP are great commands that give us very good summary options. We can summarize the data without writing dirty and complex queries with the help of CUBE and ROLL Up Operators. I have found a great link for CUBE and ROLL UP to understand it deeply. Visual Studio 2005 is a great IDE to develop .NET applications. But If we don't know the keyboard shortcut for some function we have to do it with mouse and it will take lots of time. I have found a great link which contains almost all the short cut for keyboards. ASP.NET is a great platform to develop web base application. It always been pleasure to develop application in asp.net. Microsoft has recently launched the new .net framework 3.5. There are some new features provided in asp.net 3.5. I have found a great link that will discuss and have information you want to know about asp.net 3.5 framework version. Following are the some of the new feature that are included in .net framework 3.5 and described in the article. Lots of people are in confusion whether the master pages are loaded first or content page(child page is loaded first.I want to make it more clear. Following is page execution structure of the master page and child pages. First the controls of the master page will instantiated and then control of the child page is instantiated. Then the first the page_load event of the child page is executed and then page_load of event is executed. Following are the main difference between abstract class and interface. 1. Abstract class can contain abstract method while interface does not. 2. Abstract class can contain method body while interface does not. 3. Methods in abstract class can contain any valid access specifier while in interface public access specifier is only allowed. 4. Abstract class can contain methods with body while interface can contain only method signature. For VB.NET abtract class is must inherit class. There is no diffrence between string and String. string is a alias created by microsoft for System.string. There are some other datatypes for which microsoft has created the alias. Sorry for not posting anything for long time. Actually i was busy about changing my job. We have use the dropdownlist with millians of time some developer still does not know that how to insert the listitem at particular level. Suppose your dropdownlist is having 5 items and it isbound with some datasource and you want to insert "--Select---" on the top of the order. You can do it easily with following code. So "--Select--" will be added at the top of the dropdownlist box. You can add it at any index as you want via specifing index as first argument. AppendDataBoundItems set it to true and write directly a new list item in html code. It will work. Microsoft has recently release ADO.NET Entity Framework Beta 2 and the accompanying Entity Framework Tools CTP have been released! In new version of Microsoft asp.net site Microsoft has launched the asp.net white papers which will help us to install and configure asp.net in our computers. It contains white papers with following different categories..
Windows presentation foundation is next generation technology launched by Microsoft. We can create great applications with wpf and Microsoft.net technology. Component one studio has launched studio enterprise tool set for the wpf. It contains the scheduler controls like calendar,multi month calendar and other controls like grid for wpf. The Studio Enterprise WPF Toolset is a suite of next-generation Scheduling, Charting and Grid components developed specifically for the Windows Presentation Foundation platform. The Studio Enterprise WPF Toolset Beta launches by unveiling the world's first suite of Scheduling components for WPF including Schedule, Month Calendar, and Multi-month Calendar components. From last couple of days i am trying to change my blog design. I search a lot and then i got the template from http://www.templatepanic.com/. I am thankful to guys from template panic team who have created blog templates for user like me. I have done few experiments with my blogs. 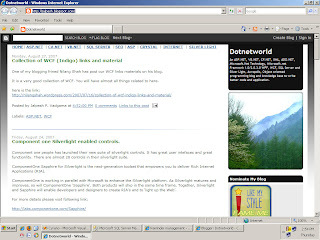 I have change my blog name to "Dotnetworld"
because this is blog around the Microsoft.net and it's related technology. Also I have put the a category navigation bar at the top which will directly redirect to the post related to that category. It will look like following. I am also planning to put a addto dig button with each post and a complete "Add To"bar at bottom of each post. At present my blog looks like following. Please put your valuable comments how you like the blog. Suggestions are also welcome. I am here for my valuable readers and i want to provide valuable content to my readers. Component one people has launched their new suite of silverlight controls. It has great user intefaces and great functionlity. There are almost 28 controls in their silverlight suite. ComponentOne Sapphire for Silverlight is the next-generation toolset that empowers you to deliver Rich Internet Applications (RIA). ComponentOne is working in parallel with Microsoft to enhance the Silverlight platform. As Silverlight matures and improves, so will ComponentOne ‘Sapphire’. Both products will ship in the same time frame. Together, Silverlight and Sapphire will enable developers and designers to create RIA's and to ‘light up the Web’. Silver light is a great technology introduced by microsoft. You can develope great application with silverlight and microsoft .net framework 3.0. I have found a great link that will give us few thougths to use minimum CPU Resources. Microsoft .NET 3.0 framework contain great features. Now we can test out via virtual labs. Microsoft have now announced the virtual lab for .net framework. Ever wanted to test software in a sandbox environment? Wouldn't it be great to be able to test the new Microsoft .NET Framework 3.0 technologies immediately, without dedicating one or more computers to the project? Now you can, with Microsoft Virtual Labs. Whenever any error occurs in ASP.NET it will give default screen which is quite messy and dirty. So how we can show error messages of our own. I found a great article that explained the way to display our message. BlogEngine.NET is a full-featured blogging platform that is a breeze to set up, customize, and use. BlogEngine.NET works with your choice of data source; you may use SQL Server, or you may take the plug’n’play approach using XML files. Layout and User interface is one of the most important things in the windows development. With great user interfaces and layout you increase performance of windows application. I have found great link that describes the layout related problems. Here is the link. As a developer we often need to develop user controls in forms for the reusability. But some time we need to handle event of the user control. For example if you have user control with button we need to handle button click event in windows forms. We can develop this type of functionality with the delegates. I have found a great articles that describes this things in very deep. Web application are getting popular in all over the world. Most of the desktop applications are transforming in web base application and with the new technology like Ajax we can build the great user interfaces just like the desktop application. Ajax is one of hottest technology in today's world . I have found great articles on Ajax. which describes every aspect of Ajax starting from whats is Ajax ? Microsoft .Net framework is component that is used to build web based and windows based application. As a developer, We all know how to build application using .net framework but we don't know underlying architecture of the .net framework. SQL Server is defacto database standard microsoft .net plateforms. Whenever you go as a .net developer. You have to get knowledge of the sql server. I have found a very good link of sql server interview quesiton. Which will help you to prepare for interview. Brad Abrams is a founding member of Common Language run time and .net framework teams at Microsoft. He is one of the key member in .NET Framework Design and Development. He has written a blog post for coding standards which help us to improve our codding style and code readability. It is need by almost every developer. Please Nominate By Blog for awards at Fame Blogging to fame. I am constantly doing blogging for more than 1 year. So If you really like my style of blogging and if you want to support me then please nominate my blog for a award. It will be great help for me.It would take just a minute to nominate my blog. It always better to get appreciation from my readers so if you think i can win this award then please visit following link and fame me and my blog. Here are some maximum number of different objects in sql server. Oracle and sql server both are great database management system and have great features. Often developer need to know what type of DBMS he should use for a particular needs.I have found a great comparison articles for oracle 9i and sql server 2000. Which describe all the feature of both DBMS and compare based on features. James Avery creates a list of ten add ins a visual studio developer must download. This contains following add ins. Microsoft asp.net team has redesigned the asp.net site. Few days back they have beta version of it. Today they have launched full version. It is a great redesign and contents are very much well organized with less images so it's load faster then old version. do visit new asp.net site. Lots of developers developing the application using Microsoft.net framework. But most the of developer don't know the underlying architecture. Future of .net framework etc. It is a great article. Every .net developer must read it. here is the link for that article. Enumeration is a great user defined data type in C#.Net and VB.NET. It is very useful in code readability. It greatly increases the readability of code. here is the example of the enumeration that contains the weekdays. Sql server joins are used to combine result data from two or more tables. Often we need to display data from two tables. Where sql server joins are very useful. There are three types of sql server joins. the data from both tables based on join condition.This join take every records of left table and looks in right table based on join conditions. There are there types of outer joins. Left outer join will display all the rows from left table of join and display data from right table based on join condition. First it will display every row of left table and looks into the right table to display data based on join condition. If matching records are found then it will display data of right table with left table data otherwise put a null values instead of right table data. Right outer join will display all the rows from right table of join and display data from left table based on join condition. First It will display every row of right table and looks into the left table to display data based on join condition. If matching records are found then it will display data of left table with right table data otherwise put a null value instead of left table data. This joins are combination of both left outer join and right outer join. First it will put data like left outer join and it will put data like right outer join. If respective records are found in opposite table then it will display data otherwise it will display null values. Cross join is slightly different then full outer join. It does not have join condition it is not required in cross join. It will display data like Cartesian product of the tables. For example if table 1 have 3 rows and table 2 have 7 rows. Then it will display 21 rows from both tables. so on it will display data. Following are some advantages of inheritance. 1. No need to write code from scratch. You can start coding with existing classes. 3. You can lots of classes with the same root but have different implementations of classes. 4. Code reusablity through inheritance increased. 7. code are easy to manage and divided into parent and child classes. Following are the access modifier in class of .net framework. Allow access to class member from any other class. Allow access to class member from same class only. Allow access to class member from same class and inherited classes. Allow access to the class member in same Assembly. Allow access to class member in same class,inherited classes and classes in same Assembly. Indicates member can be called without instantiating the class. Do you believe in standards ? Lots of people like me believe in maintaining standards, How to write software, how to write code and how to write stored procedure. I have found a great link that contains almost all the links for every standards beginning from project management to email and phone communication. They have achieved great success by following this great standards. Microsoft Silverlight is one of the hottest technology that ever produce on web. It is a Microsoft answers to macro media flash and action script. You can develope rich web user interace and dashing site with the use of Microsoft silver light and asp.net. I have found a great link that contains lots of silverlight resources and tutorial links. You can find almost all information and links about silver light from here. Traditionally from many year we have build sql server stored procedure with the transact sql. Microsoft framework 2.0 and sql server 2005 allows us to write stored procedure with other languages like C#.NET,VB.NET etc. Microsoft sql server 2005 provide integrated support with .net common language run time so we can create stored procedure in C#.NET,VB.NET also. It has several advantages over using transact sql like compiled execution,security and type safety. I have found a great articles that describes all the way to develop stored procedure with c#.net. I have found a great sites that hosts great asp.net tutorials. It is http://www.aspnettutorials.com/. It contains tutorial in following categories. ASP.NET 2.0 allows us to create some folders via right clicking project. But lots of people are don't know why we need to create that folder. Here are the description for the each folder in asp.net 2.0 that we have to create for diffrent purpose. App_code folder contains the code files for the classes, structures,enums etc. It also contains .wsdl files for web services. Typed data set files are also reside in this folder.Any of this item automatically available to whole application. ASP.NET supports themes to enable visual styles on web page. This folder contains the themes skin and .css(Cascading Style Sheet) files. App_Data contains the database for a application and other data files like .mdf,xml,text and .csv files used in web application.This folder are used to stored data related entities. ASP.NET allows us to create resource files. There are two types of resources files one is global and another one is local. The global resources files are available to whole application. While local resouces files are available to specific page only. This folder store global resource files with .resx extensions. This folder stored local resources files. This folder store web reference of web service from a asp.net 2.0 application. You can web reference via right click project in solutions explorer and then click add web reference. This folder contains assembly files for controls and web pages.Assembly files are basically a .dll files. Any .dll files found this folder automatically links to whole application. This folder structure are basically supported by asp.net 2.0. You can also create your own folder structure by right click project name in solution explorer. and add new folder. As developer in Microsoft technology we all need to know about data types supported by the sql server 2000 and sql serve 2005. We also have to know what is there ranges and where it should use. I have found a cool link that describes all the things above. If we want to transfer data from one database table to another database we need to write complex code and queries. But with sql server 2005 integration services you can do it sometimes. You have to use sql server business intelligence studio(bundled with sql server 2005 developer edition). I have found a great article that descries all the thing that how you can create a package with sql server 2005 and how you can excute this package with sql server 2005 business intelligence studio. here is the link for that cool article.. In this paper, we will explore these challenges in detail and discuss how to address them with Microsoft® SQL Server™ 2005 Integration Services (SSIS). First, let’s view them in the context of a real-world scenario. here is the link for more details. I have found a great link that desbries .net 2.0 configuration api in details. It is very easy handly and cool article. here is the link for aritcle.. I have found a cool link from msdn that will describe all the things for Windows presentation foundation. Windows Presentation Foundation and AJAX/"Atlas"
I have found a great link from http://www.codeproject.com/. that describes the how to Access proxy / firewall restricted Internet sites using tunnelling or onion routing. The article was written by Anup Shinde and he has explained all the details including what is the problem .. The solution form problem... Implementation. One of my friend Amit Agrawal(Microsoft Blogstar winner) provide a collection of most popular blogs on earth from blogger and typepad. here is the link from his blog. the RadControl Folder not found. I have searched a lot and found that one file content need to replace by the simple code. Enterprise Library 3.1 – May 2007 is a new release of the Microsoft patterns & practices Enterprise Library. The Enterprise Library is a collection of application blocks. These are reusable software components designed to assist developers with common enterprise development challenges. This release of the Enterprise Library includes two new application blocks, a software factory for creating application blocks and providers, and other new features and enhancements. To use the Application Block Software Factory and the Strong-Naming Guidance Package, you need the Guidance Automation Extensions (GAX). To modify these guidance packages, you also need the Guidance Automation Toolkit (GAT).